Born in Oklahoma, at the age of five Michael Dowdle began his musical journey on the piano. A few years later he picked up the violin and began playing in school orchestras. As his love for music grew, so did his interest in rock and roll. Because of his background, at the age of fifteen, the guitar became the natural choice and he practiced constantly. He began playing in various rock bands and almost immediately began developing a reputation as a talented guitarist. 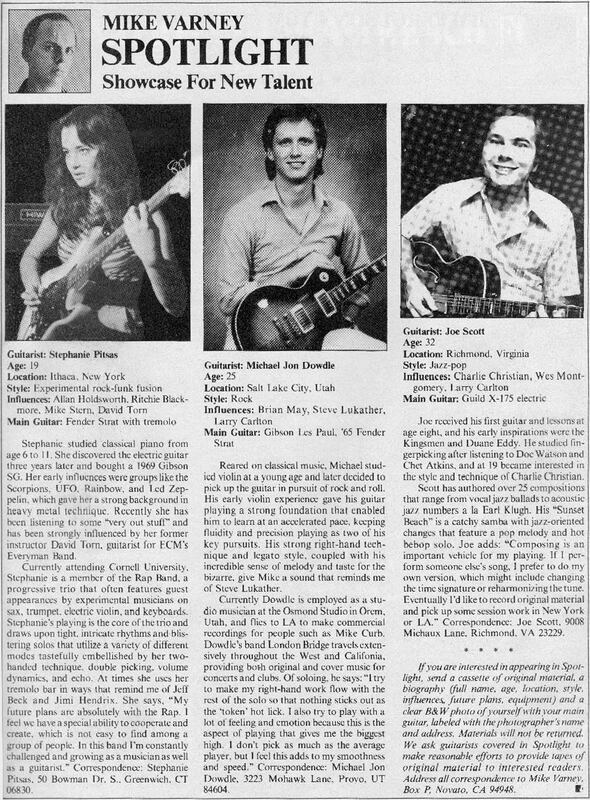 Michael was featured in Mike Varney's "Spotlight" column in the March 1983 issue of Guitar Player Magazine. He began doing studio work professionally as a session guitarist in 1980, and has since done thousands of sessions in every style of music. Some were for artists such as Marie Osmond, The Osmond Brothers, John Schneider, Mr. T, David Archuletta, and The Jets. Michael has played on several movie scores, including "Born to Be Wild," "The Stand," "Christmas in Connecticut," "The Yearling," and "Hart to Hart" among many others. Most of the studio work Michael does is for TV Networks, such as ABC, NBC, CBS, and FOX, as well as cable networks such as CNBC, TNT, and the USA network. This work includes ABC Sports Main Theme, ABC College Football, ABC Monday Night Football, FOX Fall Campaigns, and also TV shows such as Good Morning America (ABC), The Today Show (NBC), The Oprah Winfrey Show and many more. In 1993 Michael began composing and arranging for Non-Stop Productions. As a composer he has written many different themes and music for TV and radio use, including ABC College Basketball, ABC Auto Racing, ABC T.G.I.F. Promos, FOX "Under the Helmet" campaigns, ABC "It's Your Favorite" promo, Good Morning America (ABC), The Today Show (NBC), CBS- "Say I" promos, and the KGO radio theme and music. He wrote the theme for "HARDBALL", and "UPFRONT TONIGHT" on CNBC. He also wrote a new theme for CNN International as well as for CNN's new FN network and promos for Crossfire and Larry King Live. Michael has also written music for national commercials such as Buick, Cadillac, and Chevrolet. He has also written music for movie trailers for Disney and Touchstone Pictures, Hollywood Pictures and Caravan Pictures such as "Finders Keepers," "Cool Runnings," "I Love Trouble," "In the Army Now," "The Three Musketeers," "Holy Matrimony," and "The Jerky Boys". For Columbia and Paramount Pictures he has written the trailer music for "The Fan," "Last Dance," "Multiplicity," "The Cable Guy," "Red Corner," "Metro," and "Donnie Brasco." For Dreamworks Pictures, he wrote the trailer for "Antz". Michael also wrote and recorded the Utah Jazz promo music “Rock with the Jazz” in 2003. It played in commercials as well as in the arena. Some of Michael's work was also broadcast during the Olympics, as he was the composer on several promotional spots for the Salt Lake 2002 Olympics. In 1989 Michael signed with Airus Records, and released the album "Touch" in 1990. The album did well on jazz oriented radio stations and went to #7 on the R & R charts. (R&R is a chart that tracks the number of times songs from an album are played on radio stations nationally). “Touch” also features performances by Jimmy Johnson (bass player for James Taylor) and Vinnie Colaiuta. Some songs from “Touch” such as “A Brighter Day” are still being played on contemporary jazz radio stations around the country today. In 1991 Michael released another album, "From the Hip." Many of the songs on this album were also "radio friendly" and the album cruised to number 15 on the R&R Charts and to number 9 on the Gavin Chart. (Gavin is another radio airplay chart). Michael’s third jazz album, "Soulmate" on TrebleV Records, features world famous musicians, such as Simon Phillips, Dave Weckl, Alan Pasqua, Jimmy Johnson, and Brandon Fields. Released in September 2000, the album did well in radio play across the nation. One song from the album, ”…And The Moon,” won a 2001 Pearl Award for “Contemporary Instrumental Song Of The Year.” These albums are available on iTunes or at Michael’s website, michaeldowdle.com. In addition, Michael has also received the “Listeners Choice” award from the LDSBA (LDS Booksellers Association) in 2003 and again in 2007. Michael also works as an arranger for other artists as well such as Michael McLean, Hillary Weeks, Cheri Call, Afterglow, Alex Boyé, and Jesse Clark Funk among many others. In November 2000 Michael performed as a headlining artist with his band on the main stage at the Catalina Jazz Festival performing songs from his jazz albums. He has also performed his music with his band at Deer Valley, Thanksgiving Point, Abravanel Hall, the NAMM show in Los Angeles, The Baked Potato in Los Angeles and many other places including the Netherlands. He has played on stage as a guitarist with many artists including Donny Osmond, Marie Osmond, the Osmond Brothers, Brian Wilson (the Beach Boys), The Coasters, Peter Noon, Kurt Bestor, Sam Cardon, John Schneider, David Hasselhoff, Will Lee and Anton Fig (The Dave Letterman Band), Michael McLean, Jericho Road, William Joseph, Cheri Call, Kenneth Cope, Lex de Azevedo, Julie de Azevedo, Afterglow, Hillary Weeks, Jesse Clark Funk, Jenny Frogley, Jenny Phillips, the Utah Symphony and the Mormon Tabernacle Choir. Michael has also played in many other bands through the years such as Everett Lincoln, Magellan, London Bridge, etc. and is currently playing with the pop band “The Salamanders.” This band plays mostly for corporate parties (such as Delta Airlines, Usana, Grand America etc. ), conventions and weddings etc. Michael still enjoys playing concerts of his original music when he can, and has enjoyed especially traveling to Holland on several occasions over the last few years. See "pics". The newest album "CONVERGENCE", demonstrates a totally new approach to song writing for Michael that really shows off his "electric" chops. On this album there are only three instruments used, Electric Guitar, Bass and Drums. The attitude of the album is high energy rock-fusion and really challenges the skills of each player. The songs are edgy, melodic and "riff" driven but positive and upbeat. The songs are previewed (demoed) as they are written, live on YouTube and then recorded later for the CD under more controlled conditions which generates better performance and fidelity. Guitarist Michael Dowdle shoots From The Hip and delivers an upbeat, spontaneous cache of songs. Dowdle is equally plucky with electric and acoustic guitar. Electrified tracks like the Steely Dan-ed “Out Of The Blues” and a strutting “Alligator Shoes” are kicking, full band arrangements that could help energize Adult Alternative playlists without chopping up the waves too much. They pleasantly remind us of the plugged-in fluidity and lyricism of Larry Carlton. Sam Cardon provides tasty synth riffs on these live-in-the-studio performances. 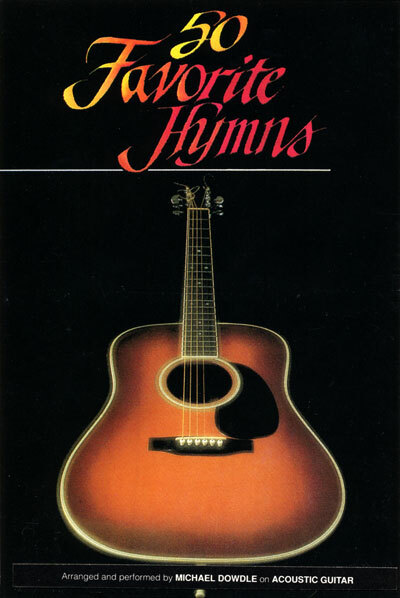 Acoustic guitar tone poems like “No Worries” and “My Best Friend” are more moody and pastoral. Last year’s release by guitarist Michael Dowdle, “Touch”, was a runaway favorite with the Synthesis staffers and our weekly Synthesis listening sessions. “Touch” was one of the best examples of combining jazz and new age together I’ve heard in quite a while. “From The Hip” still has that distinctive, often melodic Dowdle touch. However, the songs lean a bit more towards the jazz end of the spectrum. This gives “From the Hip” a slightly different sound than “Touch.” The songs also are more uptempo in nature. In general, “From the Hip” manages to come across as a good, solid jazz CD. It doesn’t, however, have the universal appeal of “Touch,” that would make it a required purchase for new age fans. I don’t know about you, but for me, nothing is more enjoyable than searching through bin after bin of CD’s and finding an absolute gem. Such is the case with “Touch” by Michael Dowdle. Michael Dowdle’s impressive guitar performance is complemented by an extremely competent backup band. Whether it’s a synthesizer solo from Sam Cardon or some appropriate drum fills from Ken Hodges, everything seems to support Dowdle’s guitar performance. “Touch” is one of those few CD’s that is absolutely perfect in every respect, production, writing and performance all are flawless. It’s no wonder that “Touch” is the number one requested CD at our weekly Synthesis listening sessions, edging out Suzanne Ciani’s new CD. During one of these sessions, someone stated that “Touch” is such and outstanding release, Airus could sell “Touch” with a money back guarantee. Everyone laughed, but you know, if Airus did offer that money back guarantee, I’m sure that they wouldn’t have any takers. It’s that good. If you have trouble finding “Touch,” ask your dealer to order it for you, believe me, you’ll be glad you did. The process of session players evolving into recording artists in their own right and pursuing solo careers is certainly nothing new in any area of music. For guitarist Michael Dowdle it was a step along the way that appears to have broadened how he approaches his music. It also seems to have shaped his musical sensibilities perfectly for PAC programmers. His distinctive guitar style can still be heard on the themes of ABC Monday Night Football, ABC Movie Of The Week, the FOX Network…and now his first solo release “Touch”. If you didn’t already know he was featured on last year’s surprisingly successful PAC CD from then newcomer Sam Cardon (“Impulse”). Dowdle’s dues have come out of a variety of experiences from The Osmond Bros. to the Utah Symphony. His melodic sense should be a winner with PAC. The opening track “Take Your Time” has a nice summertime shuffle with Carlton-esque licks that conjure up a bit of Steely Dan feel. On the acoustic side there’s “A Brighter Day” with another catchy melody. This one sounds right in the pocket for PAC. It draws you inside and leaves you feeling good. Who could want more from a song…especially a radio format that thrives on instrumental jazz which strikes a positive chord with listeners. The title track brings a fresh clean feel that you wouldn’t mind “bringing home to mom” (i.e. it aims to please.) For the most part the release “Touch” is like a soothing ride in the country. Music that engages the imagination.